You get to design your own custom dream home from scratch! The game lasts twelve rounds. During each round, you add rooms to your home and decorate them with all kinds of accessories. When the deck of cards runs out, the game ends, and the player with the most points wins! 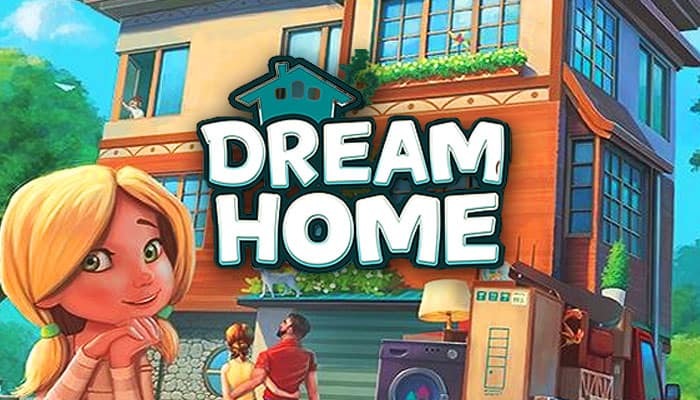 Each player receives a home board and a reference tile. Place the game board in the center of the table. Shuffle the resource cards and place the deck facedown on the board A . Draw 4 resource cards and place 1 faceup on each of the 4 rightmost spaces along the top row. (The leftmost space is the first-player space and must always be empty). Shuffle the room cards and place the deck facedown on the board B . Draw 5 room cards and place 1 faceup on each of the spaces along the bottom row. Place the decor tokens near the game board. The youngest player receives the first player marker. You are now ready to play the game! The game is played over 12 rounds. Each round, the player with the first player marker takes the first turn and play proceeds clockwise. During a player's turn, he chooses a column on the game board and takes the pair of cards in that column (one room and one resource). If a player chooses the leftmost column, he takes the card in the bottom space and the first player marker. Immediately place the chosen room card onto your home board, ideally placing it next to similar types of rooms. If no one chooses the leftmost column, the current first player keeps the first player marker and will take the first turn next round. After each player has taken a turn, the cards on the board are reset: discard any cards still on the board and refill each row (4 resource cards on the top row; 5 room cards on the bottom row). When the decks are empty, the game ends and players add up their points. The player with the most points wins. Normal Room Cards - These cards represent the main rooms in your home . They are placed on any of the ten spaces which make up the top two floors of your home board. Unique Room Cards - These cards represent non-essential rooms you can add to your home (after all, it is your dream home, isn't it?). Like normal rooms, unique rooms are placed on the top two floors of your home board. Be sure to read the card's text, as some unique rooms have special scoring requirements! Basement Room Cards - These cards represent the basement rooms in your home and can be placed only on the two spaces on the bottom floor of your home board. You can tell basement cards apart from other room cards by their dark border and their name and point value are placed at the top of the card. 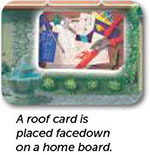 Roof Cards - Roof cards are stacked facedown on the roof space of your home board. Once you have placed a roof card on your stack, you cannot look at it again until the end of the game. There are four different types of roof cards. Decor Cards - When you take a decor card from the game board, you place its corresponding token on one of your rooms. You must place the token on a room that does not already have a decor token and matches the room type indicated on the decor card, and then discard the card. If all of your rooms of the indicated type already have a decor token or if you do not have a room of the indicated type, you cannot place the token, and you simply discard the card. Placing a decor token on a room card finishes that room. Tool Cards - Tool cards are placed faceup near your home board. The text on each tool card explains when and how it is played. Helper Cards - Helper cards are placed faceup near your home board. 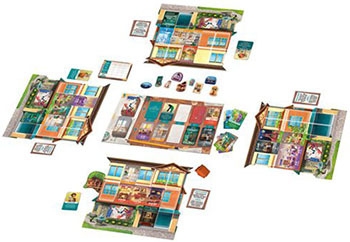 Helper cards are used at the end of the game during scoring, except for the Interior Designer, which is also used during the game. To make it easier to score certain helper cards, we recommend keeping the discarded room cards and the discarded resource cards separate. In a two- or three-player game, follow the setup steps as normal. At the beginning of each round, before the first player takes his turn, he chooses a column of cards and discards that pair of cards. The first player cannot choose to discard the leftmost column. Note: For younger players, you may wish to simplify the game by ignoring this discard rule. After taking a room card from the board, you place it on your home board. After you have placed a room card, you cannot move it unless a specific tool card or helper card allows you to do so. A A room card cannot have an empty space directly below it. B Basement cards must be placed on one of the two basement spaces. 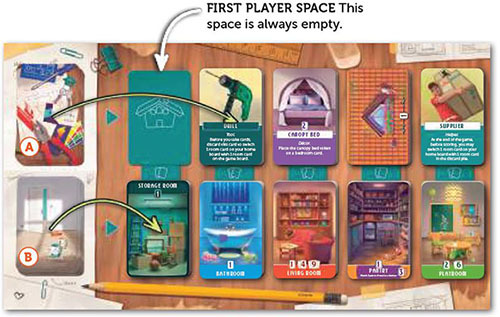 Normal room cards and unique room cards must be placed on spaces in the top two floors. C When expanding a room, you cannot exceed the maximum size specified on the room card. (For more about expanding rooms, see page 7). If you cannot place a room card, or if you do not want to place a particular room card, place it facedown on an empty space of your home board. This creates an empty room, which is worth 0 points at the end of the game. An empty room, like all rooms, cannot have an empty space directly below it. Empty rooms can be placed adjacent to each other, but they do not expand. The bedroom has a limit of two cards, so you cannot place a third bedroom card beside them. Rooms can be expanded horizontally to earn additional points. Each room has a limit of one, two, or three cards, as shown by these icons: or . A room made up of its maximum number of cards, or a room that contains a decor token, is finished and cannot be expanded further. You cannot place a room card beside a finished room of the same type; if you have no other space available for placing that room card, you must place it facedown as an empty room (worth 0 points). Note: Rooms that are vertically adjacent are not on the same floor, so they are considered to be separate rooms and score points separately. When a decor token is placed on a room, that room is finished and cannot be expanded further. Remember, if you place a room card adjacent to a finished room of the same type, the room card must be placed facedown as an empty room (worth 0 points). Empty rooms can be adjacent to each other, but they cannot be expanded. After the 12th round, each player's home will have 12 rooms. Determine your home's value by adding up your points. Score sheets are included to help add up the scores. 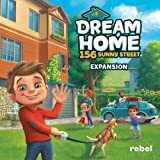 Be sure to admire all of the beautiful homes that were built during the game! When scoring, remember to use the effects of the Supplier, Handyman, and Roofer. Most rooms score points based on the number of cards that make up the room, which is based on horizontal adjacency. The room's point value is displayed on the bottom of the card. A one-card living room is worth 1 point, a two-card living room is worth 4 points, and a three-card living room is worth 9 points! The icons displayed at the bottom of the room cards show the points earned for a room made up of one, two, or three cards. Each decor token has a point value. A player with the Interior Designer scores 1 extra point for each decor token. Example: William's home has a one-card bedroom. During his turn, he takes a cat house decor card and decides to put the cat house token on this bedroom. This finishes the bedroom, so he cannot place another bedroom card adjacent to it. During his next turn, he takes the Canopy Bed decor card and token, which can only be placed on a bedroom. If William does not have a second bedroom on his home board, he must discard the canopy bed card because a room can have only one decor token. A home with a bathroom on each of the top two floors is worth 3 extra points. A home with a bathroom, kitchen, and bedroom is worth 3 extra points. Whenever you take a roof card, you place it facedown on the roof space of your home board. During the game, you cannot look at your facedown roof cards. A complete, uniform roof (four roof cards that are all the same color) is worth 8 points. 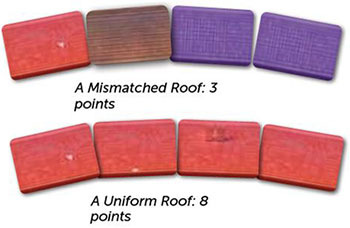 A complete, mismatched roof (four roof cards that are not all the same color) is worth 3 points. 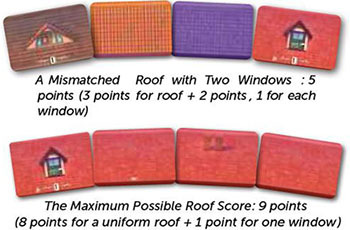 An incomplete roof (fewer than four roof cards) is worth 0 points. Any extra roof cards beyond the four you choose to use are worth 0 points. Additionally each window in a complete roof is worth 1 extra point. A window appears on only one of each type of roof card. 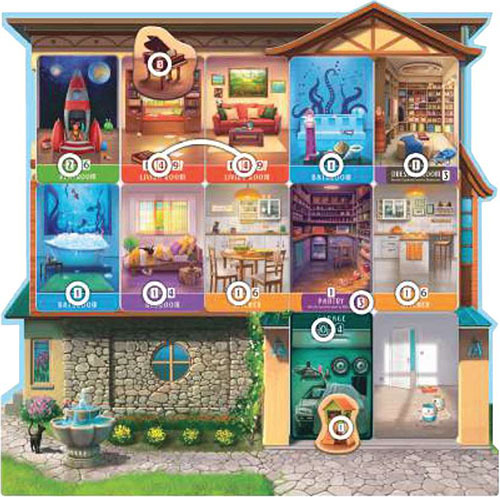 In case of a tie, the tied players search their own home for kids depicted in their rooms' artwork (you may need to look closely as some of the children are hiding with only an arm or leg visible). The tied player with the most kids in their home wins. If there is still a tie, the tied players share the victory.